SOURCE: Courtesy Harper Collins There are intimate connections between the scientific advances that expanded the frontiers of human knowledge and the democratic experiments that expanded the frontiers of human liberty. The founders of the United States of America were all well acquainted with the experimental nature of science, and they applied the same methods to their new political enterprise. “They always described the formation of the country itself as an experiment,” says Timothy Ferris, “And what isn’t widely understood is that the way that democracies work is by constant experiment.” Each election, each passage of a new law is, after all, a procedure designed to test a hypothesis about how to make constant improvements to a government. The Christian Science Monitor called Ferris “the best popular science writer in the English language today,” and his new book is The Science of Liberty. In it, he tells the story of the intimate connections between the scientific advances that expanded the frontiers of human knowledge and the democratic experiments that expanded the frontiers of human liberty. He recently joined Science Progress editor-in-chief Jonathan Moreno for a podcast interview to discuss how science rescued generations of humanity from subsistence living and brought freedom to nations around the world. In the opening pages, Ferris lays down his bold claim: “The democratic revolution was sparked—caused is perhaps not too strong a word—by the scientific revolution, and that science continues to empower democratic freedom today.” Dissatisfied with existing histories of the Enlightenment, he set out to ascertain more specifically what exactly was new about the period bookended by the English Revolution of 1688 and the French Revolution of 1789. It wasn’t simply the embrace of reason, Ferris said, because after all, individuals can reason their way into all sorts of conclusions that don’t have anything to do with the nature of reality. “Here was this new way of studying nature that disproved ancient authorities. It didn’t matter how great the authorities were,” he explained, “Aristotle could have said it—but you could conduct experiments that showed that Aristotle was wrong. And from that, it’s not much of a leap to say that, well, other forms of authority may be illegitimate as well.” Authorities like kings, as Thomas Paine would later point out in the run up to the American Revolution. Citizens of nations around the world owe their freedom to these scientific ways of thinking, which helped erode the legitimacy of monarchies. The way we live now is virtually indistinguishable from the way people lived prior to the scientific revolution—life was “nasty, brutish, and short,” as Moreno said, describing the philosopher Thomas Hobbes’s vision of the “state of nature” without government. He explained that people alive during the middle ages had no perception that living standards could get better, in part because there was no progress in technology. “People did not have the notion that there could be change and improvement,” Moreno said. The difference between that world and our current one is immense, Ferris emphasized. Moreover, science has continued to accelerate improvements in standards of living. “The United States, at the time of its founding, was what would be called a third world country today,” Ferris said. “When the United States first started being called an ‘affluent society’ in the 1950s, Americans had less than half the money that they have now.” In the larger scheme of human history, we’ve come a long way in a very short time. But in spite of all the knowledge, wealth, and freedom that flows from science, critics remain. “Dogma ruled the world before science came along and it is still the preference of the majority of people in almost every country, and certainly here in the United States,” said Ferris. But democracy is not a dogma. It is a method. “It is the most successful method of governance ever hit upon by humans, just as science is the most effective method of learning that’s ever been found,” he said. In their discussion, Moreno and Ferris also explored the postmodern intellectual movement of the 1980s and 90s, which engulfed humanities departments at many universities, but unfortunately misinterpreted science and the democratic systems it supported. At its root, postmodernism is a critique of capitalism and its related economic, political, and cultural systems. Ferris traces this problem to the two World Wars and the Cold War that followed. The European thinkers emerging from that crucible, he argues, sometimes turned away from democracy and toward socialism and a skeptical view about the power of science. Moreover, Ferris said, there is a common misperception embedded in many threads of academic education that totalitarian regimes like Nazi Germany and the Soviet Union were particularly good at science. “The widespread claim that socialist systems generally—and even their communist, fascist varieties—were more efficient than democracies is not true,” he emphasized—the evidence just doesn’t support the claim. A careful study of Italian train records, for instance, revealed that Mussolini did not, in fact, make them run on time. Postmodern rhetoric can sound at times like the claims of the intelligent design movement, Moreno said, saying that each rejects scientific expertise. “The anti-science movement in this country, which includes the religious right and the radical left and many other elements,” replied Ferris, “Its program is simply to seize on any weakness it can find in the interface between science and society.” The recent embrace of global warming skepticism by creationists fits this pattern, with its denial of “belief” in climate change. Interview by Jonathan Moreno; summary and production by Andrew Plemmons Pratt. [capaudio url="http://www.scienceprogress.org/wp-content/uploads/podcasts/20100304_ferris_interview.mp3"] The founders of the United States of America were all well acquainted with the experimental nature of science, and they applied the same methods to their new political enterprise. “They always described the formation of the country itself as an experiment,” says Timothy Ferris, “And what isn’t widely understood is that the way that democracies work is by constant experiment.” Each election, each passage of a new law is, after all, a procedure designed to test a hypothesis about how to make constant improvements to a government. 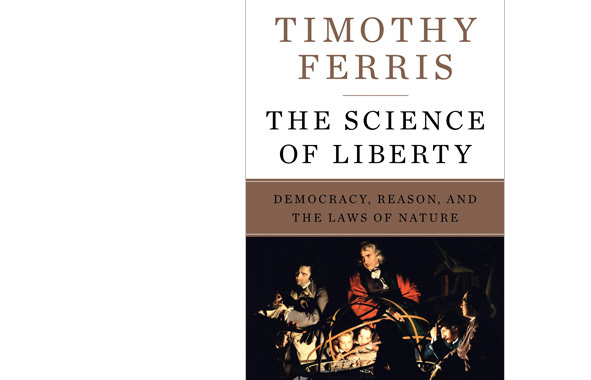 The Christian Science Monitor called Ferris “the best popular science writer in the English language today,” and his new book is The Science of Liberty. In it, he tells the story of the intimate connections between the scientific advances that expanded the frontiers of human knowledge and the democratic experiments that expanded the frontiers of human liberty. He recently joined Science Progress editor-in-chief Jonathan Moreno for a podcast interview to discuss how science rescued generations of humanity from subsistence living and brought freedom to nations around the world. In the opening pages, Ferris lays down his bold claim: “The democratic revolution was sparked—caused is perhaps not too strong a word—by the scientific revolution, and that science continues to empower democratic freedom today.” Dissatisfied with existing histories of the Enlightenment, he set out to ascertain more specifically what exactly was new about the period bookended by the English Revolution of 1688 and the French Revolution of 1789. It wasn’t simply the embrace of reason, Ferris said, because after all, individuals can reason their way into all sorts of conclusions that don't have anything to do with the nature of reality. “Science was what was the new ingredient,” Ferris said, “And science isn’t just reason—it’s experimentation. The more I studied it, the more it seemed to me that this experimental approach is also the basis of liberal democracy.” For this reason, Ferris likes to focus on a key event in the year preceding the 1688 installation of parliamentary rule in England. In 1687, Isaac Newton published his Principia, the foundational text for classical mechanics and the laws of motion familiar to high school physics students. From this difficult book describing universal gravitation, Ferris drew a vector to the nascent idea of liberal democracy. “That book really sealed the deal,” he said, as it established the “tremendous predictive power of science.” “Here was this new way of studying nature that disproved ancient authorities. It didn’t matter how great the authorities were,” he explained, “Aristotle could have said it—but you could conduct experiments that showed that Aristotle was wrong. And from that, it’s not much of a leap to say that, well, other forms of authority may be illegitimate as well.” Authorities like kings, as Thomas Paine would later point out in the run up to the American Revolution. Citizens of nations around the world owe their freedom to these scientific ways of thinking, which helped erode the legitimacy of monarchies. The way we live now is virtually indistinguishable from the way people lived prior to the scientific revolution—life was “nasty, brutish, and short,” as Moreno said, describing the philosopher Thomas Hobbes’s vision of the “state of nature” without government. He explained that people alive during the middle ages had no perception that living standards could get better, in part because there was no progress in technology. “People did not have the notion that there could be change and improvement,” Moreno said. The difference between that world and our current one is immense, Ferris emphasized. Moreover, science has continued to accelerate improvements in standards of living. “The United States, at the time of its founding, was what would be called a third world country today,” Ferris said. “When the United States first started being called an ‘affluent society’ in the 1950s, Americans had less than half the money that they have now.” In the larger scheme of human history, we’ve come a long way in a very short time. But in spite of all the knowledge, wealth, and freedom that flows from science, critics remain. “Dogma ruled the world before science came along and it is still the preference of the majority of people in almost every country, and certainly here in the United States,” said Ferris. But democracy is not a dogma. It is a method. “It is the most successful method of governance ever hit upon by humans, just as science is the most effective method of learning that’s ever been found,” he said. In their discussion, Moreno and Ferris also explored the postmodern intellectual movement of the 1980s and 90s, which engulfed humanities departments at many universities, but unfortunately misinterpreted science and the democratic systems it supported. At its root, postmodernism is a critique of capitalism and its related economic, political, and cultural systems. Ferris traces this problem to the two World Wars and the Cold War that followed. The European thinkers emerging from that crucible, he argues, sometimes turned away from democracy and toward socialism and a skeptical view about the power of science. “What it appears to have done to European intellectuals, by and large, is to have persuaded them that the scientific, democratic world that had seemed to being doing so well going into the 20th century had been proved to be a failure and even a sham and led to this hideous violence,” he said. Ferris is quick to point out that this is not true: “Prior to the rise of liberal democracy, the average person was less safe at home in bed in his little village than was the average resident of Western Europe during World War II.” Moreover, Ferris said, there is a common misperception embedded in many threads of academic education that totalitarian regimes like Nazi Germany and the Soviet Union were particularly good at science. “The widespread claim that socialist systems generally—and even their communist, fascist varieties—were more efficient than democracies is not true,” he emphasized—the evidence just doesn’t support the claim. A careful study of Italian train records, for instance, revealed that Mussolini did not, in fact, make them run on time. Postmodern rhetoric can sound at times like the claims of the intelligent design movement, Moreno said, saying that each rejects scientific expertise. “The anti-science movement in this country, which includes the religious right and the radical left and many other elements,” replied Ferris, “Its program is simply to seize on any weakness it can find in the interface between science and society.” The recent embrace of global warming skepticism by creationists fits this pattern, with its denial of “belief” in climate change. But standing up for the simple facts of our own history as a great democratic experiment doesn’t require belief in anything, Ferris contends. “It just requires an acquaintance with the historical facts of how we got to where we are now.” Interview by Jonathan Moreno; summary and production by Andrew Plemmons Pratt.